From the 14th century to present day. The immediate reason to build the new castle Točník was no doubt the fire that damaged the Žebrák castle in 1395. Shortly after that, the king started building more luxurious and comfortable castle Točník on higher ground, only 500 m away from Žebrák. Točník was built probably between 1398 and 1401 on the same rocky ridge, a hundred meters higher. In 1400, Wenceslas IV already moved a part of the royal treasure to Točník. The front side of the Royal Palace is firmly closed, with barred windows and corner bossage; the austerity of the architecture is only softened by white stucco frames around the windows. Behind this façade, the architect managed to create indoor areas full of attractive, even exciting charm. The irregular spaces inside the building were a perfect challenge for the master of the royal ironworks, who could fully unleash his craft and creativity in making vaults. Even though the Burgravian Palace is up to par with the Royal Palace in terms of the stonemasonry in windows and portals, there’s a big difference between these two buildings – almost two stages in history. While the Royal Palace marks the beginning of the new building and fortification era, and is brimming with the contradiction and inconsistency of its time, the other building is very conventional, and only follows the pattern old as the castle itself. It’s clear that the castle, with this size and striking look, wasn’t built only for the personal pleasure of the king who loved hunting. It’s proven by the existence of two palaces, so different in their internal arrangement and equipment. The building with halls was, as the name indicates, primarily used for representation purposes – it was the place for official guests. The great hall on the second floor, with the size 34 x 15 m, was even bigger than the largest representative halls of the time – Karlštejn (22 x 8,5 m), Romanesque Hall at the Prague Castle (32 x 9 m), Carolingian Hall (30 x 16 m), and Křivoklát (28 x 8 m). On the other hand, the inner residential area was, as indicated by the equipment and fortification, reserved for the private use by the king and his closest associates, and should also be his last resort. Therefore, the Royal Palace was separated from other areas of the castle, built on the very edge of the fosse, and offering ways out through several gates. After Master Jan Hus (1370–1415) was burned at the stake, Wenceslas IV didn’t spend as much time at the castle as before. He had a new castle built, Nový Hrádek near Kunratice, and his last visit to Točník dates back to September 1415. After the death of Wenceslas IV on August 16, 1419, the castle became property of his brother Sigismund (1368–1437). After only four days, he took away most of the equipment, and a part of the state treasury. In 1421, Sigismund pledged the castle to Erkinger of Seinsheim, ancestor of the Schwarzenberg house. Erkinger engaged his son Hermann to Elisabeth, daughter of Frederick of Kolowrat. Hermann was promised big dowry, and to fulfill this promise, Frederick of Kolowrat had Žebrák and Točník pledged as a warranty. In the end, both castles remained in his property. In 1425, the Kolowrats successfully resisted the 3-day siege by the army of Hussites (almost 8,000 men, including 7,000 foot soldiers and 900 riders). The army withdrew bitterly, burned down the nearby towns of Žebrák and Hořovice and continued towards Pilsen. In 1461, the castles were bought by George Podiebrad, in order not to let them in firmly catholic hands. In the end, he gave both Žebrák and Točník to Frederick of Schumburg (he was a catholic too, but loyal to his king). Since 1509, the castles were managed by Ladislaus Jagiello (1456–1516). In 1522, Louis Jagiello sold the castle to John of Wartenberg (Kostelec line), who did a lot of building adjustments on the castle. In 1534, he traded Točník for the Rohozec domain (today Hrubý Rohozec) with Volf Krajíř of Kreig. 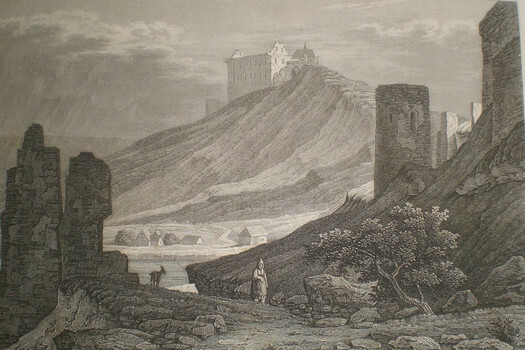 The members of the Krajíř house searched both castles for the treasure they believed was hidden there, and they virtually disassembled Žebrák. After unsuccessful attempts, they sold both castles to John of Wallenstein in 1544. In 1552, Točník was bought out by Maximilian II and given to John the Elder of Lobkowicz and Zbiroh. The Lobkowicz did numerous renaissance adjustments at the castle. The Ladislaus Lobkowicz gave the castles to his wife Magdalene, countess of Salm. After the munity of George Popel of Lobkowicz (in which Ladislaus had taken part), most of the Lobkowicz property was confiscated, and Točník and Žebrák again become the royal property owned by Emperor Rudolph II. In 1595, he paid out Magdalene. He was also the last king ever to visit the castle. The castle was consigned to John Henry Prollhofer of Purkerstorf, and since then it was managed by the commanders of Zbiroh. Točník became a state prison, and until 1865 it was the property of the Czech Chamber. However, the stewards moved their residence to Zbiroh, and Točník gradually decayed. In 1674, only a janitor stayed on the castle. The Thirty Years War and the preceding events were devastating for Točník. In 1620, under the commander John Kolenec of Koln, imperial troops invaded the castle and damaged it severely. The final blow came on October 18, 1639, when civilians took refuge at the castle. In 1640, the castle should have been equipped by cannons to fight against the Swedes, but they were never used. In 1681, a report by Bohuslav Balbín indicated that Točník is still habitable. In 1722, most of the castle was still roofed, but it wasn’t inhabited anymore. In 1750, the function of local commanders was cancelled, and the castle was managed by the directors from Králův Dvůr. Since 1834, both castles were managed by the Mining Authority in Příbram. In 1858, the Imperial Council approves the sale of the domain to Vincent Kirchmayer and Samuel Simundt, financiers from Krakow, but they failed to meet the agreed terms and so the castles went to a new owner. In 1864/1865, they were bought, together with the whole domain, for ten million guldens by the industrial tycoon H. B. Strossberg alias “the railroad king”. After several economic failures, he sold the castles in 1875 again to the Colloredo-Mansfeld house for 3,350,000 guldens. In 1923, Josef Colloredo-Mansfeld sold the castles to the Czechoslovak Tourist Club – Točník for 2,000 Czk and Žebrák for 8,000 Czk, as the latter included brewery cellars. The club started numerous reconstruction works, unfortunately without the supervision of heritage conservationists. The cellars, the ground floor of the Royal Palace and the well were cleaned, and the floors of both palaces were covered in concrete, in a very crude and insensitive way. In 1945, the castles became the property of the Czechoslovak Sokol Community. Since 1953, both castles have been owned by the state; several static safety measures were introduced. Since 1994, both castles (together with Křivoklát, Krakovec, Hamous Farm No. 22 in Zbečno and Točník Brewery) were managed by the organization Státní hrady Křivoklátska (State-owned Castles of the Křivoklát Region) established by the Ministry of Culture. Since January 1, 2001, the castles have been managed by the National Heritage Institute.